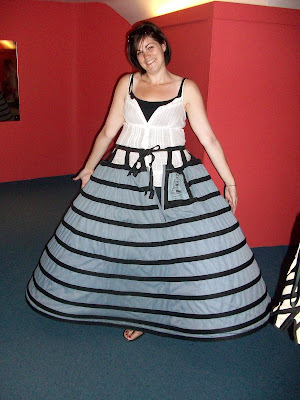 One of the best parts about Bath was going to the fashion museum and trying on corsets and hoop skirts. They had clothing from the 17th century right up until today, but most of our time was spent in the dress up room. 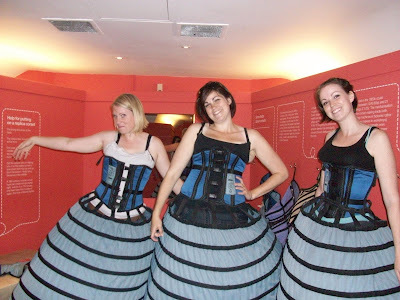 I'm sure we didn't have our corsets as tight as they are supposed to be, but even so I had trouble breathing in mine. It was difficult to sit down and bend over. 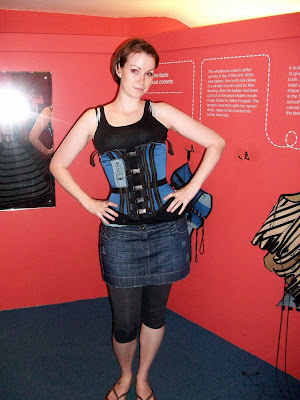 I can't imagine wearing a corset everyday with all the other layers of heavy clothing the women wore back then. 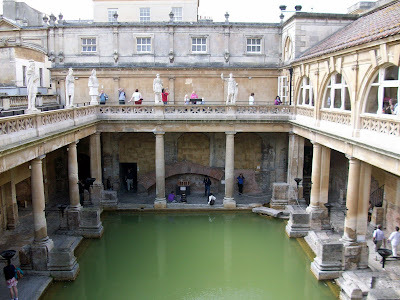 We also went on a tour of the Roman Baths. This place was huge and there are still areas of it that haven't been uncovered or were destroyed over the years. At the end of the tour you can sample the mineral water that everyone believes is so good for you. It was very warm and VERY mineral-y. Lacey and I had a sip but we dared Amy to drink a whole glass of it, which she did. I'm pretty sure she almost threw up. 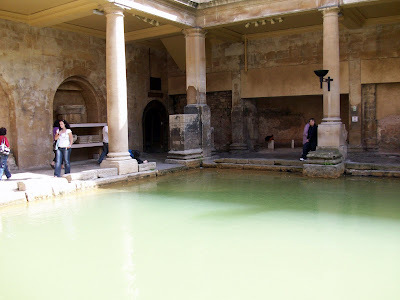 Just so you know, the Romans didn't bathe in water that colour. It turned green from the rain and air mixing with the minerals... or something like that. Bath is about 45 minutes from Stonehenge and even though it was getting dark and we knew it would be closed already, we decided to head there anyways. It was so cold that all we did was take a few pictures and get back in the car, but I'm glad I can say I've seen it. Overall, the trip was amazing. In the end, it doesn't matter how much money you spend, what matters is that you have fun and make memories to last a lifetime. I think I can safely say for the three of us that we won't forget this trip anytime soon. We are two Canadian sisters who moved to Edinburgh for a year. We are here to experience life in a different country and travel as much as possible.